If Austrian economics is the theoretical foundation for Bitcoin, I think Ronald Coase is the inspiration for general cryptonetworks. In 1937, Coase wrote a seminal paper titled “The Nature of the Firm”. It laid the groundwork for a whole new branch of microeconomics, called the theory of the firm, and won the 1991 Nobel Prize. The mark of geniuses, in social sciences at least, is their ability to uncover important hidden truths that are so self-evident in hindsight. And Coase is one of these geniuses. In a typical fashion, he asked a simple question that was of no interest to most economists before him: if markets are so good at allocating resources, why do firms exist? After all, markets are one of the most worshiped concepts since Adam Smith, and rightly so. It was the process of answering this question that unveiled vitally important insights that never occurred to the world. Before exploring Coase’s question, it seems necessary to define the firm and the market. In modern economic theory, one way to look at the firm is that it’s an institution where economic activities are centrally coordinated by an entrepreneur. By contrast, the market is an institution where economic activities are decentrally coordinated by the price mechanism. To better understand the difference, suppose we want to outsource a project to a freelance software engineer, and offer him a contract of $50 per hour. A competitor of ours wants to hire the same guy for a similar project, and offers him $100 per hour. Most likely, he will sign the contract with our competitor. This is the price mechanism of the market. In the firm, on the other hand, a software engineer jumps from project A to project B, or from team A to team B, not because B offers a higher compensation, but because he is ordered to do so. This is coordination mechanism by the entrepreneur. As a champion of capitalism and decentralization, you should be wondering what Coase was wondering, if the market is so efficient at maximizing people’s incentives, why is central planning, a.k.a. the firm, so prevalent in our lives? In other words, why wouldn’t all economic activities carried out in a completely decentralized way by means of contracts between individuals? Usually, when two competing concepts A and B exist at equilibrium, they must be making a tradeoff somewhere, such that A is better than B at one thing but worse than B at something else. 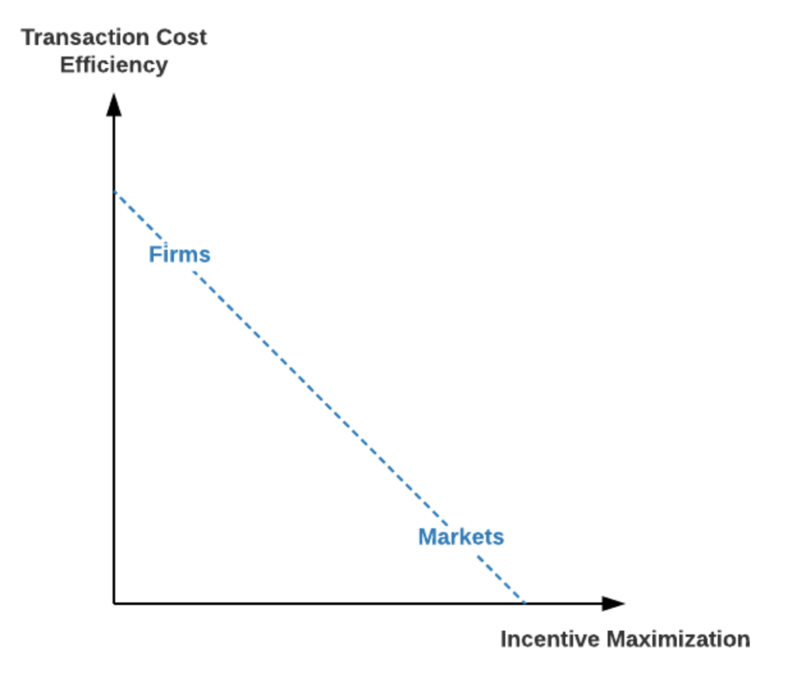 In our case, the firm must be sacrificing incentive maximization for something that the market lacks. Coase’s answer is transaction cost. Economists are sometimes obsessed with the idea of zero transaction costs, and with purely intellectual questions related to how a world of zero transaction cost would look like. In order to carry out a market transaction it is necessary to discover who it is that one wishes to deal with, to inform people that one wishes to deal and on what terms, to conduct negotiations leading up to a bargain, to draw up the contract, to undertake the inspection needed to make sure that the terms of the contract are being observed, and so on. All these are transaction costs, be it money or time, which exist within the market. But these costs are significantly lower within the firm. As information flows more freely within the firm, the entrepreneur can more easily find a suitable employee to execute certain tasks. With no or little informal negotiation, the entrepreneur simply orders the employee. The entrepreneur punishes underperformers by demoting or firing them. And this is ultimately a major reason why the firm exists alongside the market. For certain types of economic activities, the firm reduces the aforementioned transaction costs. They blur the dividing line between the market and the firm. In fact, they offer the best of both worlds. They are likely not strictly better than the market and the firm in all scenarios, but they offer a worthy alternative in some scenarios by pushing the tradeoff boundary outward. Similarly to markets, they allow people to organize economic activities decentrally without a ruler. Meritocratic participants engage, through pure economic incentives instead of orders, in activities such as money supply, computation, storage, prediction, content production, and content curation. 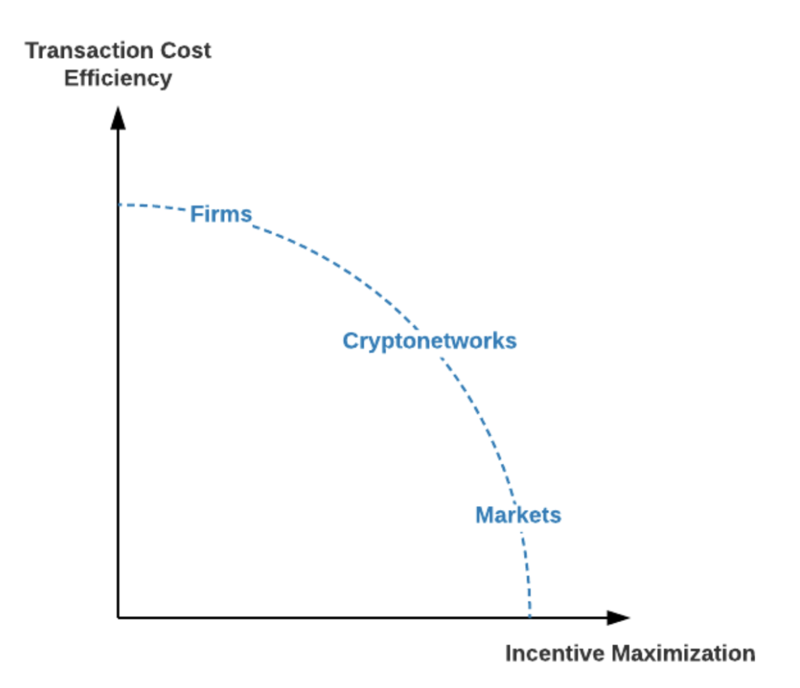 Cryptonetworks are ultimately a type of networks, and networks have “network effects”. Every existing participant knows that adding a new participant creates value for themselves. As such, every existing participant is incentivized to search for new participants, thereby creating an exponentially compounding army of recruiters. This contrasts the market’s price mechanism where the recruiter is just an individual or a small constant number of individuals. Bargaining is fundamentally a process of discovery. Discover what you are willing to accept and what the person on the other side of the table is willing to accept. It can be a lengthy process due to communication frictions. Sometimes, the lack of skin in the game can cause one party to withdraw from verbal commitments, which is costly for the other party. This is where open-source software (OSS) and tokens may shine. OSS openly and fully communicates what the terms are. If someone isn’t happy with the terms, they can propose new terms by forking the code and changing the parameters. Tokens allows the discovery process take place in the form of liquid trading. It’s effectively a negotiation between a large of parties on both sides of the table, where new bids and offers are placed swiftly to reduce information asymmetry. It provides the additional benefit that all parties put their money where their mouth is. Legal barriers are the most severe cost of doing business across many jurisdictions. Smart contracts can cut through this Gordian knot of jurisdictions. [They] can decrease vulnerability to capricious jurisdictions [and] dependence on these obscure local legal codes and enforcement traditions. Of course, all laws cannot be encoded in software. For starters, how can physical punishments be executed using code? However, with internet-native monies and Turing-complete virtual machines, financial rewards and punishments certainly can. No theory is perfect, but some are useful. Coase’s Nature of the Firm is no exception. Numerous scholars built on his foundation and painted a fuller picture. It is nevertheless an elegant and insightful one. It improves our understanding of why the market and the firm coexist. Cryptonetworks have the potential to bridge the gap between the market and the firm. It complements the firm by bringing the meritocracy of the market. It complements the market by offering the transaction cost benefits of the firm. As such, it’s not inconceivable that more and more economic activities will be organized using cryptonetworks in the coming decades.